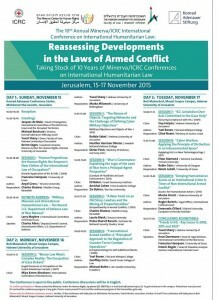 The Minerva Center for Human Rights at the Hebrew University of Jerusalem and the Delegation of the International Committee of the Red Cross (ICRC) in Israel and the Occupied Territories, in cooperation with the Konrad-Adenauer-Stiftung, cordially invite you to their 10th Annual Conference on International Humanitarian Law (IHL), which will be held in Jerusalem on 15-17 November 2015. 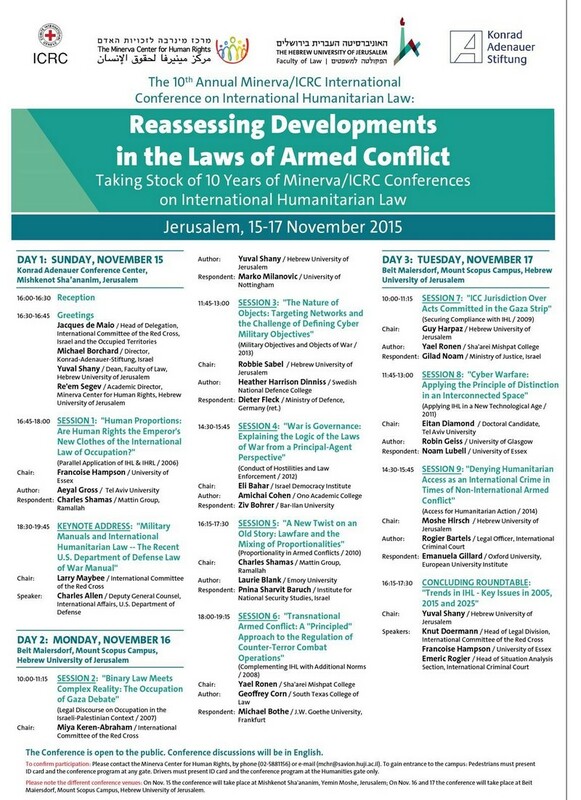 To commemorate the anniversary of this series, our 10th annual conference will be a special one, reassessing the state of international humanitarian law over the last decade and into the future. To this end, one published paper from each of the previous nine conferences has been selected as the cornerstone for a session on a key IHL issue – with the original paper presented by its author with the benefit of historical perspective, followed by extensive comments by a respondent, and audience questions and comments. The conference will open with a keynote address by Charles Allen, Deputy General Counsel for International Affairs of the U.S. Department of Defense. An experts’ roundtable will conclude the three days of discussions. Day One of the conference will be held on the afternoon and evening of 15 November, at the Konrad Adenauer Conference Center at Mishkenot Sha’ananim, Jerusalem. Days Two and Three will both be full days of discussions, at the Mount Scopus campus of the Hebrew University of Jerusalem.